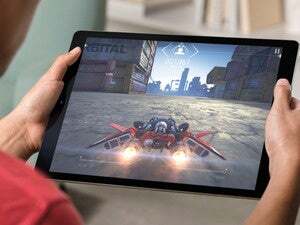 iPad Pro rumor watch: Apple isn't crazy enough to change the location of the Smart Connector, is it? Seriously, have we all gone mad? The home button will disappear. It will gain a TrueDepth camera for Face ID. The headphone jack will be removed. OK, all good so far. While the last bit is a new rumor as far as I know, it's hardly surprising, given that Apple all but declared a courageous war on headphone jacks with the iPhone 7. 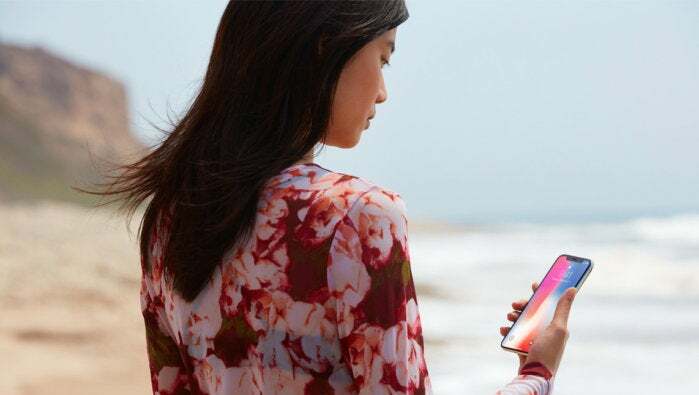 The shrinking bezels, home button-less frame, and TrueDepth camera all corroborate rumors we've heard before, and I fully expect the new iPads to adopt a similar design as the iPhone X, albeit with larger bezels and no notch. But there's more to this rumor that brings a little confusion. Actually a whole lot of confusion. According to the site, Apple hasn't solved the TrueDepth camera's relatively limited field of vision, so apparently you'll need to hold the iPad in portrait mode in order to use Face ID to unlock it. And that's where this rumor goes off the rails. Despite the orientation of the Apple logo and the home button, the iPad is very much a landscape device, particularly when it comes to the Pro model. Even Apple thinks so. Just scroll down the images on its iPad Pro site and you'll see the majority of them displaying people working and playing with the iPad in landscape mode. Most of the iOS multitasking features need the tablet to be in landscape mode to be of any use. And of course, the Smart Keyboard only connects the iPad Pro in landscape mode. Because ... it is impossible to unlock the main unit sideways, the position of the Smart Connector which had been equipped on the side (will be moved) to the bottom close to the Lightning connector. 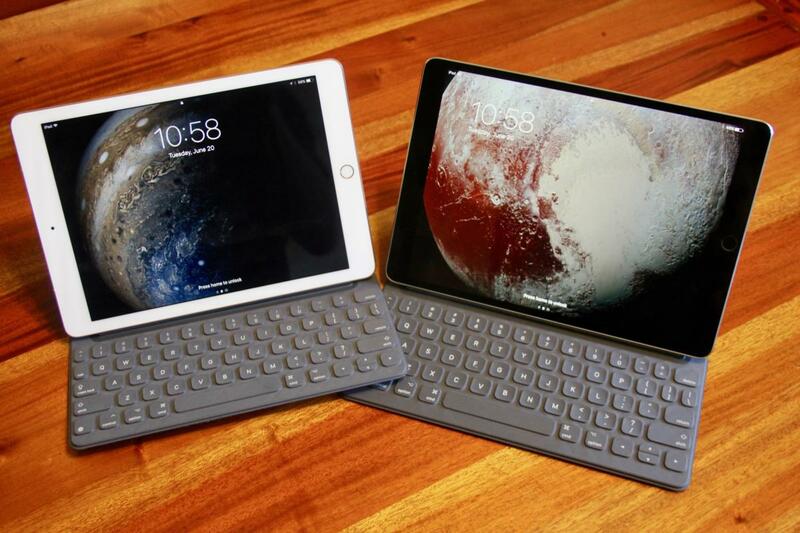 For this reason, the Smart Keyboard for the next iPad Pro may be changed to the vertical position. OK, what? So I'm supposed to believe that instead of waiting a year to properly figure out how to get the camera to recognize a face when turned sideways, Apple will be doubling-down on portrait mode? In 2018? After years of trying to convince us that the iPad is a PC replacement? Macotakara is reporting that Apple will move the location of the Smart Connector to the bottom of the device. That seems... unlikely. And kinda dumb. Who in their right mind would buy an iPad with a keyboard that docks in portrait mode. Here's a test: Turn your MacBook on its side and tell me how useable it is. Go ahead, I'll wait. Crazy right? Corroborating this rumor is a purported iPad Pro CAD obtained by Steve H. of OnLeaks that shows a weird new connector on the back of the iPad. At first glance the new port looks like something like an oval Touch ID sensor, but that makes even less sense than the Smart Connector rumor. We can't see the long end of the device so there's no way to know that the smart connector has gone away, but the speculation is that this is a new connector for the keyboard, despite the logistics that borderline on absurd. Now, changing the Smart Connector to something more streamlined wouldn't be as crazy as, say, swapping out the Lightning connector with USB-C. 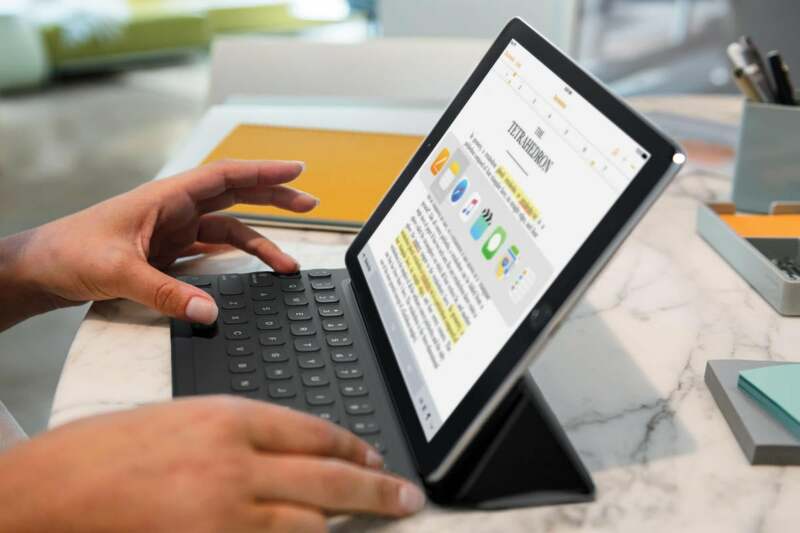 The only accessory that works with that particular connector is the keyboard, and with new dimensions all but certain for the iPad Pro, it's unlikely that the old Smart Keyboard works with the new models anyway. But the placement is weird for a keyboard. As it stands, the iPad Pro snaps into the keyboard on its bottom edge, giving the case flexibility to function as a stand as well as enough support so it doesn't tip over. This placement and size of this new connector doesn't seem able to do either of those things. Apple will keep the location of the Lightning connector on the bottom device but move it closer to the left corner (and by extension, the Smart Connector). Apple will be adding a second Smart Connector at the bottom of the iPad Pro so you can dock your iPad in either orientation. The camera will move to the long edge of the device like it is on the MacBook. Let's break down the plausibility of each of these. Option one is somewhat likely in my mind. Moving the Lightning port to the corner wouldn't really affect many people (I can't imagine there are too many iPad Lighting docks in use) and it would make connecting Lightning headphones less unsightly. Option two is much less likely, as the only reason to dock the portrait Smart Connector would be for Face ID, which is silly. Face ID is nice, but it's not worth changing the iPad's identity to get it. But option three is what I think will happen, meaning the entire iPad Pro will switch to landscape mode, logo and all. That would make Macotakara's rumor technically correct, in that the the Smart Connector would be positioned across from the camera to compensate for the TrueDepth camera's inability to see sideways, but still make the iPad Pro useable with a keyboard attached. That still doesn't explain what the mysterious port is, but I'm willing to bet that it has nothing to do with a new orientation for the keyboard. Maybe it's a magnet for the Pencil. Or a new port for third-party accessory makers. Otherwise, iPad Pro sales are bound to crater. Apple has positioned its high-end tablet as a PC replacement for a while now, so expecting people to switch to portrait mode while sitting at a desk is nuts. Face ID and Animoji will be nice features, but neither is worth sacrificing the usability of the iPad Pro. So, consider this rumor debunked, for all intents and purposes. Maybe I'm wrong and Apple will try to sell us on the iPad somehow being better as a portrait device. But if that happens, it'll need a little help from Steve's old Reality Distortion Field.